Design Process: Swatchin’ It! – Knit-a-Doodle Do! This is the part of the process I have a love-hate relationship with. I love working with the different fibers and yarn. On the other hand, sometimes what you have planned doesn’t always work out. Determining the yarn of for each design typically comes to me while I’m sketching, but often I find yarns don’t always work out. Sometimes there isn’t enough stitch definition. Other times, the yarn colors don’t blend well. Knowing how a particular yarn is constructed is probably the most important thing to a knitwear designer. It determines your overall fabric. A book titled Knitwear Fashion Design by Maitte Lafuente depicts how many different yarns knit up and how to draw them. It’s a good book for sketching as well as swatching. 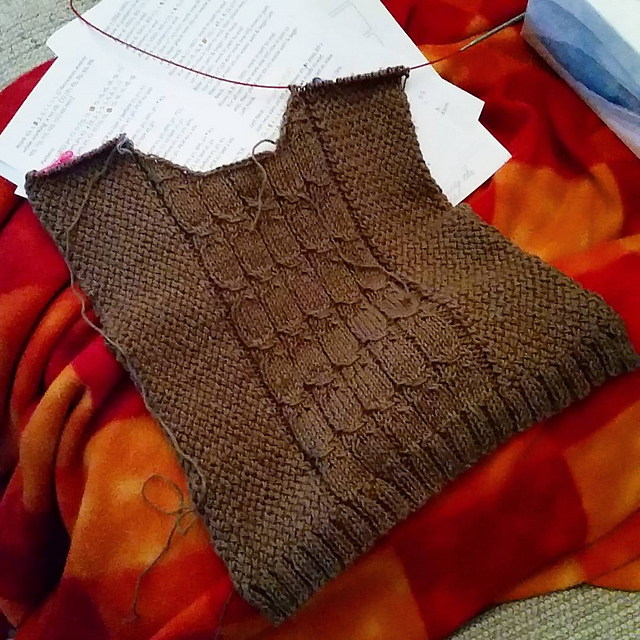 Translating between sketch and swatch is another task knitwear designers must do. Solid knowledge of how your stitches will look will make selecting the right yarns easier. My swatches are typically 5″ or 6″ wide and long as I need them to work on repeats. The key is including all of the stitch patterns within the swatch. Working out odd decreases and increases are helpful to swatch, but after the necessary length for measuring gauge. The Mannish Sweater was one of those swatches where nothing wanted to work together as planned. The fabric shrank in the center because I was using a stitch pattern with slipped stitches. I would have had to make a separate center, sides, back, and sleeves for that to all turn out correct. Piecing is not my favorite thing. Is it really anyone’s thing? It was a happy accident because it led me to Stitch-Maps. Now, when I develop the shawl pattern for Fall/Winter 2018, Stitch-Maps will provide a more visual approach and change things for me without swatching. So much patience and yarn will be saved by this process. Of course, the final design will require swatching. What is on a computer screen is far from reality when it comes to fabric construction, especially when it comes to handspun. Handspun is a non-conforming yarn. There are moments of glory where the perfect diameter and draw are achieved flawlessly. And then there are moments where you tried your hardest, but it will not conform to the ideal. So, you just drift in and out of good times. I envy all that can spin a consistent yarn. I do very well with lace weight but struggle with anything larger than DK weight. Forget a worsted weight handspun from me. So, this new shawl is going to showcase my lace weight. It’s going to be a tricolored shawl from natural colors. The first is a ecru cormo. The second is a Cormo and satin angora rabbit blended yarn. The other is a cashgora silk. It’s going to be a blast to work up. 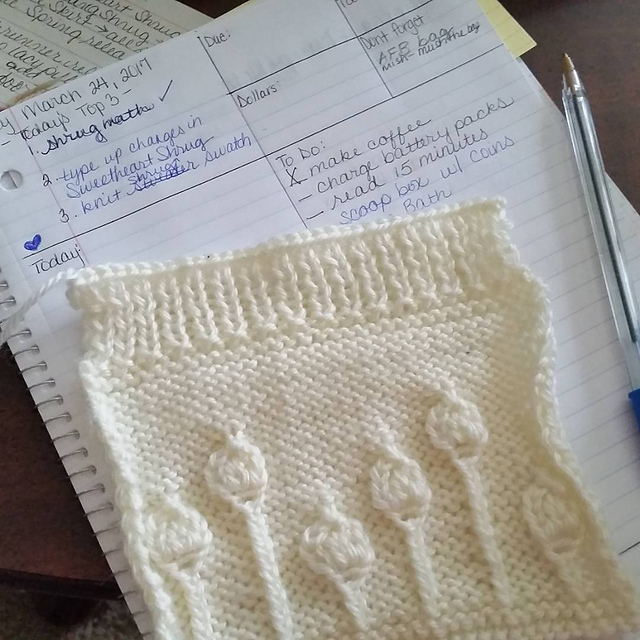 Knitting a swatch is a necessary evil for knitters, but essential to the design process. Not only does it show how your work will layout, but it allows us to calculate yardage requirements. I hinted at this in my last post and will go into more detail here. When a swatch is complete, I weigh it in grams on a postal scale. This tells me that in “x” square inches is “y” grams. For example, I knit a 5″ by 5″ square, which gives me 25 square inches. That swatch then weighs 10g. Using a manufacturers tag, the yarn I used is 420 yards per 100g. Therefore, 4.2 yards are in 1g. My swatch uses 42 yards of yarn to create a 25 square inch piece of fabric. Let’s say my design is 550 square inches. I’ll divide that number by the square inches of a swatch. That number is 22. This calculation is multiplied by the number of grams, which then multiplied by 4.2. This process gives us total yardage required to complete the design. It would need 924 yards. When asking for yarn support, you’ll have to divide that number by the amount of yarn within a skein, ball, hank, or what have you. Designers need to know this to estimate how much yarn to request accurately. An absurd amount will likely yield in a negative response. Knitting a swatch for design purposes is rather straightforward. I hope you stay inspired or became inspired by this series. If you have any questions, please, contact me.